Last but not least, JinJiangli 锦江里. 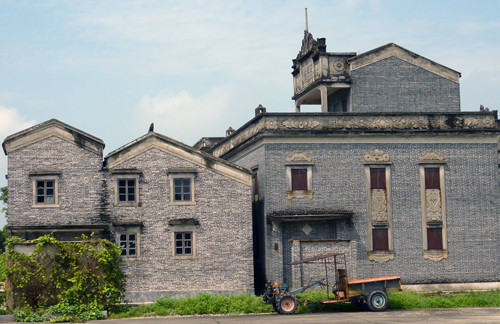 The village of Jinjiangli is the furthest Diaolou Cluster from Kaiping and is home to what many believe to be the most spectacular Diaolou building: the Ruishilou 瑞石楼. 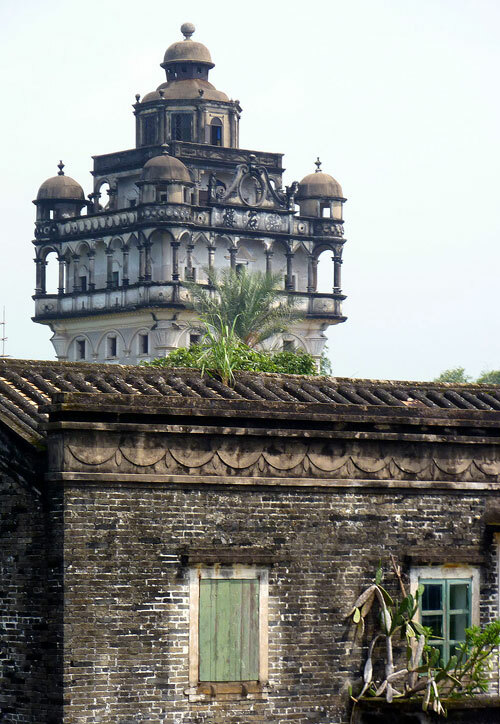 With its unmistakable Indian Raj design, pillars and colourful decorations, the Ruishilou seems from the distance to be a part of Mughal India dumped in the middle of a classical southern Chinese landcsape; it really is an extraordinary sight as you approach the village and this imperial looking building comes into view, looming over the rice paddies. 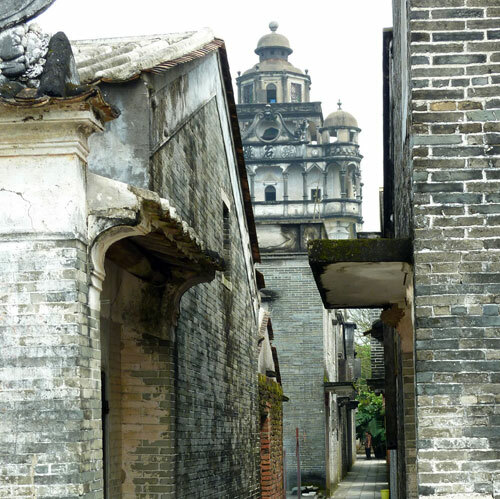 However, Jinjiangli is more than just one Diaolou. 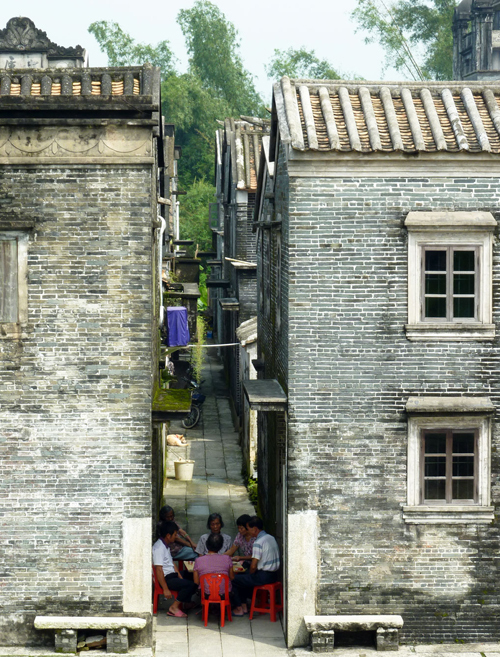 There are several other splendid examples of Diaolou in the village, as well as some marvellous vernacular buildings. In fact, the entire village is completely unblemished by any white tile, or plain nasty, modern constructions. And, unlike the more touristy Zili village, there are still many locals living in the buildings who go about their daily lives oblivious to the camera wielding tourists. 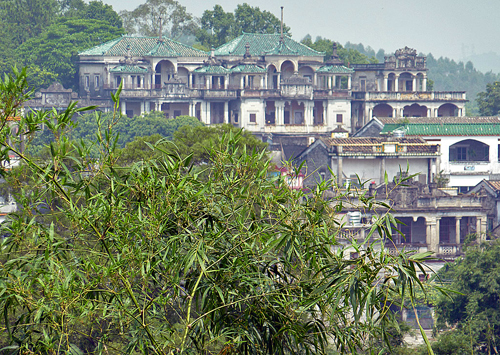 On arriving at Jinjiangli, climbing one of the high Diaolou is a must. Actually, for the best views you should climb the Shengfenglou 升峰楼, a high spectacular building designed by a French architect in 1919, from where you get great views of the towering Ruishilou and the attractive village below. Entrance to the Shengfenglou is included in the village ticket. 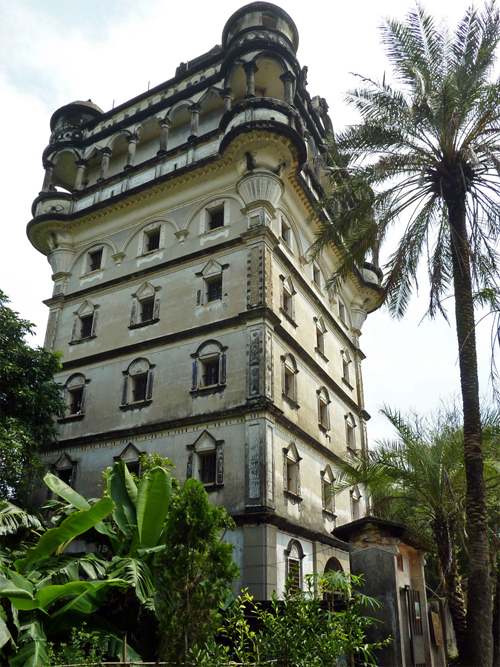 However, the Ruishilou is still in the private hands of the descendants of the family who built it. It is only open at weekends when one of those descendants, a great grandchild, comes and charges 20 Yuan to visit and climb the tower. 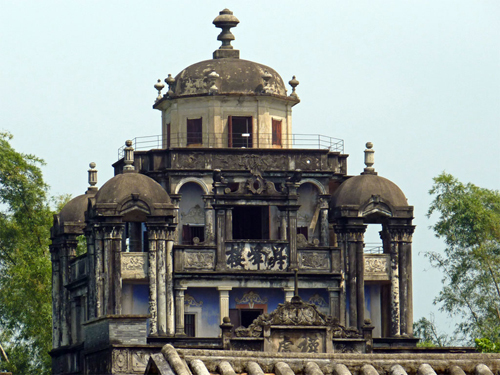 The building dates from 1923 and is absolutely stunning: looking at its rounded pavillions jutting out of the four top corners, its rows of elegant columns, and even the swaying palm trees by its front gate, you could easily imagine yourself in India! Yet, it wasn’t in India, but in nearby Hong Kong where the merchant who commisioned the tower made his fortune. Since then, the family’s fortunes seem to have sadly declined. The only remaining descendant is a rather pathetic old man who shuffles around pointing at family heirlooms, such as fading portraits and a small collection of antiquities displayed in the groundfloor reception area; through an open door, we could see a tiny, rather Spartan, sideroom where he sleeps at weekends. 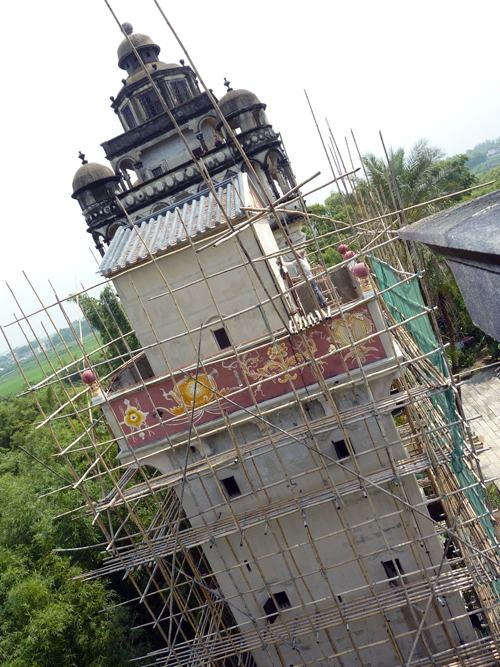 There is some restoration work being carried out on one of the adjacent Diaolou in Jinjiangli, and from what we could tell, everything was being done using traditional methods including the scaffolding that was completely made of bamboo. The interiors of the Diaolou are quite Spartan; most of the objects on display are rustic farming tools and wood- fired kitchens, but the bedrooms are quite atmospheric. Above the – now rickety – wooden four-poster beds, there are wooden platforms for storing clothes and other items in heavy, metal-studded chests and boxes. Next to the beds, some beautiful red-laquered chests and boxes used to serve as night- tables and seats at the same time. The one thing we can´t really get are the ceramic pillows! How on earth anyone could ever sleep with his head on one of those is beyond us! However, some of the family photos in the Ruishilou are interesting and you can see that once, many years ago, the families of the émigrés in the Diaolou lived grand lives of opulence and relative modernity, especially given the remote and rural surroundings. On reaching the open terraces at the top of the Diaolou in Jinjiangli, not only do you have glorious views over the village, but you are also immediately struck by the number of other villages and towns in the vicinity that are home to even more lofty Diaolou and fine-looking buildings, which pepper the landscape as far as the eye can see. 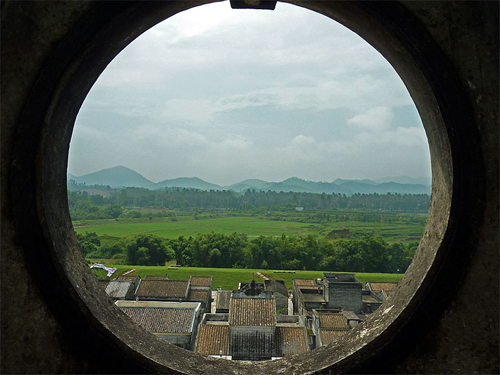 In the aftermath of a tropical downpour and in the shimmering heat of a summer’s day in Southern China, these villages, with their magnificent buildings sprouting out of the electric green rice paddies, make the scenery one of the most exotic and enchanting in all China. We’d love to have had more days to explore the area. 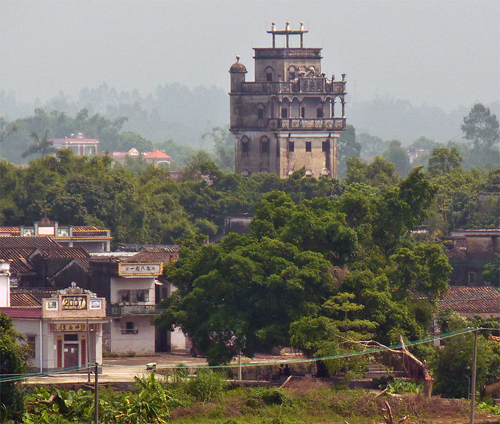 Buses from Kaiping’s Yici bus station run to Jinjiangli throughout the day, but stop on the main road from where you’ll have to walk a kilomere or so to the ticket office. A bus may be the the best option if you want to spend more time exploring other villages in the vicinity. 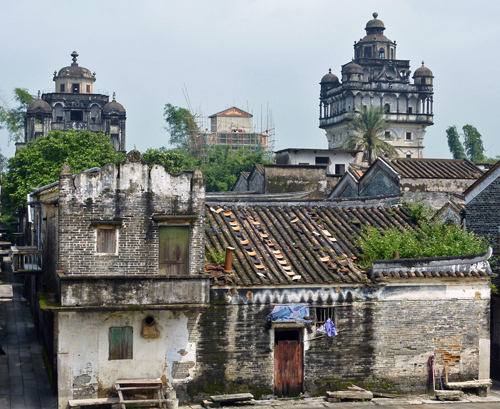 If you are hiring a car from Kaiping, make sure your driver gives you plenty of time to enjoy the place. Try and get the driver to stop, or drop in on other villages that look interesting. Getting to Kaiping is no sweat. Take a bus from any of Guangzhou’s bus stations. As we were staying on Shamian Dao, we used the nearby Fangcun bus station. To get there from Shamian Island, take the subway line one from Huangsha and get off at Kengkou station and cross the bridge. There are hourly buses for 60 Yuan, which take 2½ hours. They leave you at Kaiping’s new Yici 义祠 bus station, which is a few kilometres from the central Kaiping Binguan and the waterfront. Regular buses from Kaiping also go to Shenzhen, Zhuhai, Zhaoqing (the one we took) and Hongkong. 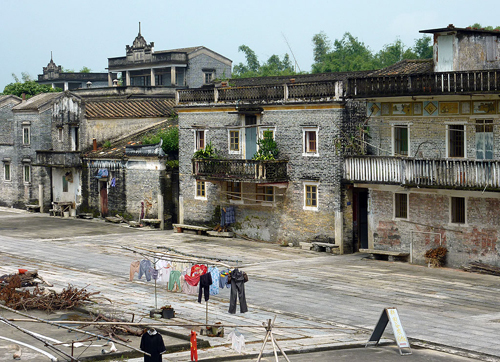 We didn’t see any Accommodation options in Jinjiangli. There might be something if you asked around. 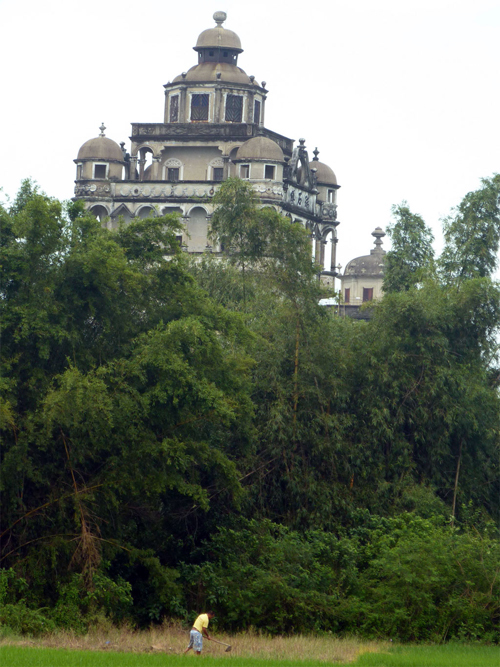 We stayed in Kaiping at the Kaiping Binguan. It’s a huge building on the waterfront. Rooms are big and clean and cost 265 Yuan for a double with a rather meagre breakfast included. A taxi from the new bus station costs 7 Yuan. We didn’t see any restaurants in the village. In Kaiping, a hundred meters from the Kaiping Binguan on the second floor of what was once the Overseas Chinese Hotel, is a buzzing Huoguo (Sichuan hot pot) restaurant, packed to the gills with locals and with a huge selection of ingredients (You need to be able to read Chinese to order from the menu). Opposite the Yici bus station is the excellent, though slightly cavernous, Green Garden restaurant 绿洲大酒店. Tasty Dim Sum is served in the morning, and an excellent picture menu helps you choose the fantastic fish and seafood. The prices are far more reasonable than in Guangzhou.